Announcement Check out our 20% off sale on our skincare creams! Check out our 20% off sale on our skincare creams! Flower Essence - Birth Portal: Welcome! Flower Essence - Get it Done! Our Portal essences are vibrational medicine for joyful embodiment +soul wellness. Created in sacred space and within the container of ceremony, they support shifts in consciousness. They are born from the offerings of plant and flower spirits, the elemental kingdom, and cosmic energies to provide personal and planetary support. We weave in our human offerings of prayer and invocation to the mix and a beautiful synergy is born. Our one of a kind formulas are always handcrafted with gratitude and respect and in reciprocity for the natural world, Mother Earth and the stars. It is our wish to support you in inviting harmony, resonance and flow into daily life with essences. Essences work with our energy bodies and can have a beneficial impact as we address wellness on all levels. An essence is a vibrational remedy that carries the vital life force energy or “soul signature” of a specific flower, gem, planetary influence, nature phenomenon, or environment. They bring the unconscious into the realm of the conscious in ways that support shift. Additionally, essences assist our entire being to awaken the healing intelligence within the physical, emotional, mental, energetic and spiritual self. They are an entry point to bringing the unconscious to light. When we can see the way through, we are more able to enact changes that we wish to incorporate into our lives on many levels. Essences will not make anything happen that your soul is not ready for. Portal essences are gateways that invite a new perspective and can move us beyond the known into the mystery. Portal essences have the unique informational blueprint that draws down cosmic energies for support in seeding the new Earth codes of transformation and elevation into higher frequencies. In addition to plant and flower signatures, portal essences also have a connection with universal energies and are accompanied by channeled messages from Spirit, ascended masters, and personal guides. In addition to elements used in traditional essence making, we also incorporate the astrology of the moment, sound healing, mantra, sacred geometry symbols and codes from star energies that wish to be part of the essence’s blueprint. Portal essences have been found to be a support for alignment, balance and chakra healing. They are shifters of consciousness, awareness awakeners, potent allies, and guardians at the gates of change. 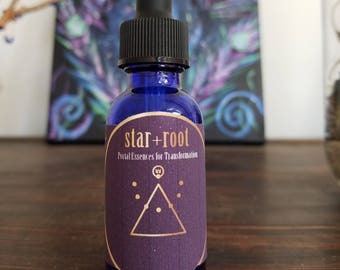 star+root portal essences can be a wonderful support in the process of awakening to personal and global evolution and anchoring a new paradigm of unity consciousness. Who would benefit from using star+root? If you are on a spiritual path of awakening and committed to personal and global evolution, embracing a new paradigm of unity consciousness and seeding the new Earth codes, star+root can be a wonderful support in the process. ​​Clients have found these remedies to be a support for alignment, balance, clearing, invoking and healing and instrumental in shifting consciousness. Essences are created by a process in which flowers are infused in water and bathed in sun or moonlight for a period of time. The birth of an essence is a collaborative partnership between us and nature. An infusion holds only the energetic blueprint of a plant or flower and does not contain any of the original source material used to make it. The essence is then preserved with alcohol or vegetable glycerine. Our essences are made in accordance with traditional infusion methods and principles, to be safely enjoyed by people and pets, and to enhance wellness. They are unlike herbal tinctures and essential oils. They have no taste or smell and can be taken internally and used topically. They are a wonderful complement to other healing modalities. Sprays are also available without essential oils by special request for those who are sensitive or prefer unscented products. They are for external use only. Please do not ingest spray products. We create time tested and mostly organic ingredients in our skin care product line for face and body. We add essences, essential oils, prayer and invocation to potentiate the energies. The result is beautiful, radiant skin. I have a daily meditation practice, and spend a lot of time in nature. Many of these remedies have been created in very remote places on the earth. 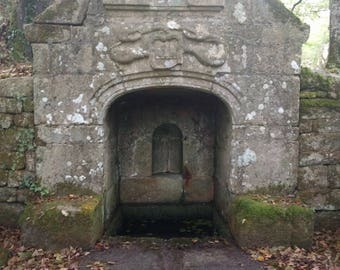 This allows for a unique alchemy that combines wildness with the clarity that is produced after being in nature's silence, without the noise, distractions and disturbances of daily life. The result is often described as being a portal out of the constraints of space and time. I am honored to have been called upon to midwife these essences for the healing of humanity and the earth, and to offer them to you at this time. star + root: portal essences are not intended to diagnose or treat any medical conditions. These essences are homemade and have not been evaluated by the FDA. By ordering these products, you are voluntarily agreeing to this disclaimer. Results will vary from person to person. For any medical symptoms, conditions, or concerns always seek advice from a licensed health care professional. Essences can be used as a complement to other forms of treatment but are never a substitute.